This book gives a complete outline of the Western Wisdom Teaching as far as it may be made public at the present time. It contains a comprehensive outline of the evolutionary processes of man and the universe, correlating science with religion. Part I is a treatise on the Visible and the Invisible Worlds, Man and the Method of Evolution, Rebirth and the Law of Cause and Effect. Part II takes up the scheme of Evolution in general and the Evolution of the Solar System and the Earth in particular. Part III treats of Christ and His Mission, Future Development of Man and Initiation, Esoteric Training and a Safe Method of Acquiring Firsthand Knowledge. Certain alterations have been made on tittle page since the publication of the first edition which was entitled CHRISTIAN OCCULT SCIENCE instead of MYSTIC CHRISTIANITY. It was dedicated to Rudolph Steiner to whom , as a Teacher , Max Heindel was greatly indebted. Also, just above the message and mission was a quotation from Paul: "PROVE ALL THINGS". The autor , Max Heindel, born Carl Louis F. Grasshoff, was an engineer whose occult interests led him to the Theosophical Society shortly after the beginning of the century. By 1905 he was a theosophical lecturer. Inspired by the Elder Brothers of the Rosicrucian Order , he traveled in 1907 to Germany with his friend Dr. Alma Von Brandis to hear a cicle of lectures of Rudolf Steiner . Later his meeting with that knowledgeable teacher , in Europe appeared to him several times one whom he described as an "Elder Brother of the Rosicrucian Order." So he could learn about occult truth from Steiner until he knew enough to be able to be given the rest by the Elder Brothers. So Steiner's teachings was in between what Max knew from the Blavatsky teachings and what he received from the Elder Brothers. It was a step that the Elder Brothers knew Max needed so that he could go on further. 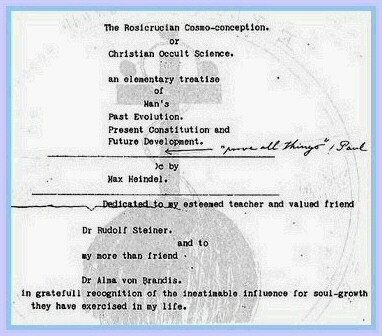 As Max Heindel himself wrote in his dedication of the first edition of the Rosicrucian Cosmo-Conception he received much valuable information from Steiner, but according the sharp research of Charles Weber the more far-reaching body of Teachings contained in the Cosmo must originate from the Elder Brother, both because Heindel states this and because the Cosmo's has information not otherwise available in the public domain or available without supersensible perception of an advanced degree. Returning to the United States, he wrote down what he had been taught and published it as his first book, The Rosicrucian Cosmo Conception, still the major introductory text of the Rosicrucian Fellowship that he founded. The first center was founded in Columbus, Ohio, but within a few years the centers could be found along the West Coast from Seattle to Los Angeles. In 1910, while recuperating in a hospital from his recurrent heart condition, he had a vision of the future center on Mt. Ecclesia in Oceanside, California. That center remains the headquarters of the group. Heindel retracted the first edition�s dedication statement in the second edition of the Cosmo, printed in 1910. From the beginning of November, 1907, to the end of March, 1908, the writer devoted his time to the investigation of the teachings of Dr. Steiner, who was absent from Berlin nearly all that time. In the last of about six personal interviews with Dr. S. the writer mentioned that he had commenced a book along occult lines; a compendium of the teachings of the East and West. Dr. S. then urged that if any of the teachings promulgated by him were used he ought to be mentioned as authority and source of information. In consequence the writer agreed to dedicate the work to Dr. Steiner. During January, February and March, 1908, the Elder Brother, whom the writer now knows and reveres as Teacher, came at times, clothed in his vital body and enlightened the writer on various points. In April and May, after unwittingly passing a test, the writer was invited to journey to the estate on which is found the Temple of the Rosy Cross. There he met the Elder Brother in his dense body; there he was given the far-reaching, synthetic philosophy embodied in the present work�which in the opinion of many old students in England, on the Continent, and in America, embodies everything that has been taught in public or esoterically in the past, besides much more that has never before been printed. Therefore the unfinished manuscript for the book mentioned to Dr. Steiner was destroyed, but as the later and more complete teaching given by the Elder Brother corroborated the teachings of Dr. S. along main lines, it was thought better to dedicate the book to Dr. S. than seem a plagiarist. Of that there would have been small danger, however, for the plagiarist invariably gives less than the authority from whom he steals, and it will be found that in any case where previous works are compared with the present, this book will in all cases give more information. The dedication has therefore been a mistake; it has led many people who merely glance at the book to infer that it embodies the teachings of Dr. S. and that he is responsible for the statements made herein. This inference is obviously unfair to Dr. S. and a careful perusal of pages 8 and 9 will show that it was never intended to convey such an idea. The writer does not see how to convey the true idea in a dedicatory sentence, hence has decided to withdraw the same with an apology to Dr. S. for any annoyance he may be caused by the hasty conclusions concerning his responsibility for the Rosicrucian Cosmo-Conception. The above explanation for Heindel�s retraction conveys a spirit of generosity. He affirms that Steiner�s teachings are �corroborated,� that is, are confirmed, �along main lines� with those given by the Elder Brother. In fact, this passage implies that the dedication would have been retained if Heindel could be assured the reader would not hold Steiner responsible for the book�s verbatim (p. 9) contents. This is a curious word to use (the original word was �authoritative�) for it suggests a fully articulated predecessor. If some Rosicrucian Fellowship students have previously harbored reservations about the appropriateness or relevance of Steiner�s writings, surely now those doubts may be dismissed, for Heindel, not to mention the Elder Brother, implicitly sanctions their value. The reason for his dedication remains in effect�much valuable information had been received and continues to resonate, �along main lines,� with the Brother�s transmission. But in deference to Steiner, to prevent Cosmo readers from assuming that the book is an authoritative statement of Steiner�s teachings, Heindel withdrew the dedication. This book is in a class of its own--a life-altering read! The "Cosmo" is a book I first encountered in a public library in Wichita, Kansas in 1974, and it is an event that I shall never forget. It is not an exaggeration for me to say that the concepts in this book have truly changed my life, although at times it has not made life especially easy. Max Heindel presents a "grown-up" version of Christianity that takes much thought to grasp, but is well worth the effort. In the centuries to come, Max Heindel will be recognized as one of the giants of the 20th century, along with Einstein and Martin Luther King, and it will be sad commentary upon the benighted nature of the last century that so few have thus far reaped the rewards of his written legacy. If religion were equated with mathematics, church Christianity may be likened to basic arithmetic, and Rosicrucian Christianity may be likened to advanced calculus. Reading the "Cosmo" for the first time is one of the most intellectually exhilarating experiences life has to offer. This book was written by Max Heindel, the founder of the Rosicrucian Fellowship of Oceanside, California--a group which is still quite active today. This is Heindel's own unique Rosicrucian philosophy; it is not the Rosicrucianism of the AMORC or any other group currently labeling themselves Rosicrucians. One must eventually put aside the pointless quibbling as to which group harbors the "real" Rosicrucianism (because every group will give a differing viewpoint) and ask a much more relevant question: does the philosophy WORK? Heindel's philosophy has worked for a great many people, and this book is considered by many to be his magnum opus. Heindel's brand of Christian Rosicrucianism doesn't work well with traditional mainstream Christianity. He introduces into basic Christian theology various occult concepts, not to mention a strong dose of astrology. These viewpoints will be interesting to students of esoteric Christianity, but will doubtless seem like heresy to the average Fundamentalist Christian. This book outlines Heindel's worldview, and it's very complex. This is not easy reading. People accustomed to fluffy pop occultism and "how-to" texts that can be devoured in a single sitting will be disappointed. This is rather intense, intellectually engaging material. Some readers will find many of Heindel's assertions hard to believe. Others will delight in his complex views of humanity and the various worlds through which mankind travels. This book contains material on the visible and invisible worlds, human evolution, rebirth, nutrition, the mission of Christ, occult analysis of Biblical texts, the fall of man, the law of consequence, animal spirits, esoteric training, and a great many other topics. There is SO much to study here, in fact, that it seems almost daunting. Still, many people do study this book, and many have reported benefiting from it. The book isn't for everyone. It's not a quick, easy self-help book. The dryness of the text can be a bit of a problem for some. Remember, though, that the first edition was printed in 1909 and has changed little (if any) since then. Some of the science will seem outmoded and some of the social commentary (for instance, on matters of race) may seem hopelessly dated, as well. Still, it's an interesting book, on the whole, and if you can stick with it, you might end up learning something. This book has an answer to those souls who haven't find it whether in physical sciences or in traditional religions. Max Heindel shows to the world, as he received them from The Rosicrucian Order's Elder Brothers, the teachings of a higher philosophy; teachings that speak to us of our relationship with God, our human fellows, and the meaning of our existence in Earth. I personally found this book a precioushelp to understand how my destiny is a result of my own acts, since the "Law of cause and effect" taught by The Rosicrucian Fellowship, and how we can change our destiny, changing our lives and the way we approach it. This book can change your life. My advice: take a look... you may find it fascinating too. I found this book forty year ago in the library of my old math professor. I became a scientist and an author. This book has giving me so much light and inspiration. 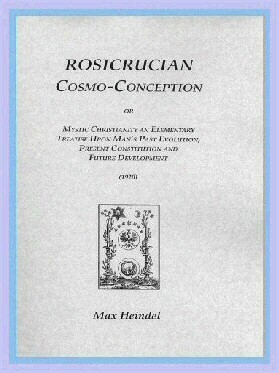 This books written by Max Heindel, who was an Initiate of the Order of the Rosicrucians and founder of The Rosicrucian Fellowship in 1919, is the most complete resource for occult teachings.Above all the Fellowship is a Christian organization, and it follows Christ, preaching the gospel and healing the sick. This is the book for us all (humans!). Who are we? Whence do we come from? Why are we here? Where are we going? What are we going to do with ourselves to be IT (I AM)? This book is very difficult to read from the beginning. But as you read and "re-read" and you put what you have read into practice, Ah! you will see the LIGHT. This book is not meant to be read lightly. That is, do not read it to simply obtain knowledge. If you simply want to obtain knowledge or intelligence only, you will be very disappointed. If in wisdom, you will find joy more abundantly. It is your life. Put your life in good use and you will be IT. This book reveals the true man and his journey through involution, evolution and epigenesis. This book also reveals the latent potentials of man and how man can transmute his latency into dynamic powers. This book authored by Max Heindel furthermore reveals the true Rosicrucians and their mission to help man. It has been once said that: "for, each step we take to acquire knowledge, we must take three extra steps to improve our character." This book was written with the help of the ROSICRUCIANS to present to the Western World the Mission of the Christ and it is therefore a must for all Christian sects, especially the priests, ministers and the like to read this book. This a book we must all read. This book deals with many esoteric topics, including metaphysical physiology and cosmology, and a history of the evolution of the human soul from before awareness, before form, through various incarnations of our planet on various planes, to eons in the future. Compared to this understanding, time lines of the great Yugas (240 million-year cyles) are but a blink of the eye. Laggard souls, and animal and mineral life waves, each experiencing their various points in evolution in different planes and conditions, account for the myriad of lifeforms and types of consciousness on this planet. The book also deals with the nature of the Christ, of Yahweh, and of other aspects and divisions of God and Divine offices. In an attempt to bridge to the understandings of the readers at the time this book was written, the author references some medical and physical concepts that no longer ring true today. But after you work through those difficulties, you will see the vast concepts that he is trying to convey. The author, Max Heindel, is an ascended master.